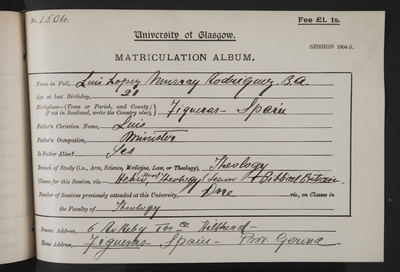 Luis López-Rodríguez Murray studied Theology at the University of Glasgow from 1903 to 1905. Born in Figueras, Gerona, he was the son of Scot, Emily Murray (born in India) and Luis López Rodríguez. His parents were key figures in the development of the Figueras Evangelical Mission, which would have greatly influenced their son's choice to study Theology at the University. Murray graduated BA from the University of Girona before enrolling at the University of Glasgow in 1903, aged 20. During his two years of study, he took classes in Divinity, Church History, Hebrew and Theology. He went on study Medicine in England and Paris. Luis returned to Figueras, where he became a medical missionary, also setting up a masonic lodge in his clinic. He published Holy Water and the Microscope in 1910. In 1936, as an ardent supporter of the Radical Socialist Republican Party, López Murray wrote an article for newspaper El Heraldo entitled Alegrémonos (Let us rejoice), celebrating the left-wing coalition's election win, the Frente Popular, over the National Front opposition. Shortly thereafter the Spanish civil broke out, and López Murray was appointed President of local branch of La Cruz Roja (The Red Cross). He died around 1937.